I running into this New Year Full steam ahead. I have enjoyed making lots of new creations and presenting them on the site! I hope you find it fun to visit and find something new every time. So excited about sewing! There doesn't seem to be enough time in the day for all my hands want to get done. My vow to fall in love with sewing was just what my heart needed! This and a precious granddaughter! For those of you who follow on my social media sites, I hope you enjoy my indulgence of posting a pic or two, or three, or four! The site has a new category: Embroidered toweling. Love doing these. Valentine themed towel is currently in a hoop right now. My New Year resolutions have already begun. Number 1. I have a nice white linen skirt and I am going to embroider a flower, bee, heart, leaf (more like 400 of those probably!) a little bit of whatever I am working on through out the year. I started with this cute dandelion. At the end, I hope to have a beautiful little bit of 2019 to wear proudly. Number 2. Get to this blog more often! One down! I hope you find coming to this site fun and always click on something that inspires you! Bust out that needle and thread! Download the New year Stitchery. I am going to make sure 2019 is going to be stitching year! Happy Stitching Throughout the Year ! Hope you are enjoying sweet spring things wherever you are! I still have snow! In fact, where I live we just got our biggest snowfall of the year this weekend! Four fresh feet of snow in my yard right now. It is very pretty and welcome in dry California! In spite of the weather, I am enjoying sewing spring things. I love getting comments and emails from all of you. Often, they are questions on how to do techniques. So, I have decided to add some how-to's to my blog. Today, it will be Sweet Stitched Easter Eggs! These sweet eggs are fun and easy! Follow here, and I hope you learn something new! ​Step One. Collect your supplies. I have a kit available on my site that contains all the wool felts and floss. There are still some extra's you need: Embroidery needles, freezer paper, glue, pen (with removable ink - helps ie: Frixion), pencil, stuffing and wonder clips are a big help! Step Three. Press the freezer paper templates. Rough cut the freezer paper templates out and place onto corresponding wool felt colors with the shiny side down. Press with a hot, dry iron. Cut out on the traced line. Peel freezer paper off the cut out wool felt piece. Reuse the freezer paper template to cut out more egg shapes, flowers and leaves. One wonderful advantage of wool felt and felted wool appliqué is the you can use either side of the wool! This means, I only need to trace one chick wing and I can cut two wings and flip either one to face which ever direction I need! Step Four. Glue motifs to egg shapes. ​You need four egg petal shapes for each egg. So there are four sides. I put a flower cluster on opposite sides of the egg and a motif on opposite sides. You can change this up of course! This will be in the example used. In this post, I will be making a chick egg. One great hint I can share here is shown in the example. I always include the finished design in my pattern pages. This way, you can use this pattern page to build your chick or lamb. Put your pattern page right onto your ironing board. Then I put the body of the chick on the pattern page, then I add a small dot of glue where the head and wing will overlap. Place these shapes onto the body matching the outside edges of the head and wings from the pattern page. Then I hit them with the iron to help dry the glue. At this point, I scoot them of the pattern page and build another chick in the same manner. After the second chick is done, I can pick up a whole chick turn it over add a couple spots of glue and place it on the egg shape. Let the glue dry before starting step five. I whipstitch all the motifs in place. I use one strand of floss that matches the wool color I am going to sew in place. I do not do a blanket stitch. You can if you want but it is not necessary. I let the pretty wool felts or wools be the star and delicate light whipstitch holds them on. In each pattern is an example of how to do the whipstitch. I use three strand of floss for most of my embroidery work on wool felts. The wool felts or wools tend to absorb the stitches so I use more strands and do not pull too tightly so my stitches stay on top of the wool. Most embroidery on the wool felts is simple. So I recommend drawing your embroidery lines by your own hand. No need to trace. If you use a removable pen ( Frixion - heat removable or, blue water removable pens) you can take your bad lines off and re-do! ​The flowers all get a french knot in the center to hold them down The french knot is three strands and I wrap the needle three times to make a significant knot for the center of each flower. The leaves are backstitched veins holding them on. Just tuck a leaf under the flower and back stitch in place with three strands of green floss. Eyes on my little characters are three stranded french knots in black floss but only two wraps of the needle. The eyes tend to get leaning if there are two many wraps. I like my eyes to be tight little perfect knots. When embroidery is done, remove your guide lines. Here you get to see my messy backs! I do not worry about it. It is all inside on the step 8! Now, lay two egg shapes right sides together. Clip or pin to hold in place. A flower cluster shape on top of a chick shape. Starting 1/4 inch from the top, sew along the right side only. Stop 1/4 inch from the bottom. Repeat for the next two egg shapes. Open up your joined halves. Place right sides together and clip or pin. Make sure your tops match at the joined seams. I had one seam going to the right and one seam going to the left to minimize bulk. Sew around leaving an opening for turning and stuffing on one side only at the point shown on the pattern page. Step Eight. Turn and stuff. Turn your egg inside out. Being careful not to catch embroidery threads and pulling on them. I always check before stuffing in case I have pulled on a french knot and it needs a little touch up! Stuff with small bundles of stuffing at a time. While stuffing, I am kind of shaping the egg as I go. When you have sufficient stuffing, Turn the raw edges into the stuffing and sew closed by hand with a single strand of matching floss. With two strands of floss I made big X's down the side seams. I thought it gave fun little extra stitches. You can make it more fun with crazy stitches going down the sides! I hope these eggs make you smile and reading this helps you feel confident to create and fill your home with sweet spring things! Happy Valentine's Day to all you fabric lovers! I decided months ago to fall involve with fabric again. I thought about how a few years ago it seemed I was having a secret affair with fabric! I would plan time around her (I can't tell you why fabric is a female, but she is in my heart), I would sneak in alone time with her, and pine away for vacations with her and my girlfriends! When I started this little pattern design company and then ultimately my retail shop, I found fabric starting to add a little pressure. She was becoming a responsibility in my life. I still got a pitter-patter in my heart when I saw a new line of fabrics, but I began to worry about sales and need rather than how she made me feel. So easy how we let work take over our lives. These past few years have been filled with new added responsibilities. Fabric was absolutely not in the foreground of my thoughts. I even considered a new occupation? I was missing my husband. A companion. And I was feeling quite unlovable. Then I remembered how I used to love fabric. I used to have to be called from my sewing room to join my husband for some activity. Ugh! So frustrating. Just one more stitch please. I knew I had to fall in love again. All over again. With fabric. So, I began dating fabric again. I remembered how she filled my mind with new ideas. Exciting things to be made. Fun with friends in sewing groups and excursions to find new amazing projects. Fabric fills my heart and time again! Today, I can say, I spend lots of time in my sewing room. Fabric is there to greet me in the morning and there to say, "Goodnight, good work Barri." in the evenings. My heart is filled with joy and appreciation. Also on Favorite Necessities Page are my favorite notions! Lots of lovely notions to make our sewing lives easier like, embroidery needles in several sizes, thimble pads to keep my fingers safe, and marking pens to trace darling designs to a background. I wish you and your loved ones a very Happy Valentine's Day! As I hug my sewing machine a little tighter, I wish you Happy Stitching! In this season of love, I would like to give love to my favorites! Fabrics I cannot live without, backgrounds! They are not pretty or exciting until they get a bit of stitchery on them! I have added 1/2 yard cuts to the website to celebrate these faithful friends! They have one thing in common, they are light in color. Other than that, they can be a muslin, an aged muslin, a yummy soft flannel or a tone-on-tone polka dot. Go to the Favorite Necessities page to find these. ​I have been sewing fiercely ! I am starting the new year with a stitchery gift to you. This cute stitchery pillow is a free download on the site. Visit the Newest Things or the Downloadable Patterns pages to find this pattern. You can be making it today! ​I am awfully proud of myself as I so prefer having a needle in my hand rather than a keyboard at my finger tips. But, I persevered last year and am proud to say, there are lots of patterns to download on the site. I am finally liking and understanding the tech work! ​As you probably are making resolutions, I am too! I resolve to do more of a social media - ack! I hope to bring you a bit more of my life here in the mountains. A bit more sewing news. And a bunch more new projects! Bareroots is looking forward to a New Year full of cozy warm and wonderful things! I hope your New Year finds you loving, laughing, stitching and visiting my mountain shop! February has always been a special month for me. (It's my birthday month!) And for all of us, February is the time of year to celebrate the special loves in our lives. For this new February, I am introducing a series of "Little Quilties". For February, for love, for you to celebrate with me this special month. ​There will be a new Little Quilty every month. You might have caught a peek at other little quilties if you have followed my Facebook and Instagram Pages. You can count on these social media sites and the Bareroots website getting filled up with lots of new things! For additional February fun, I have added a free download of this XOXO Love You Pillow. There are kits available for this sweet cushion. This will be up for only the month of February. Then it will be going into a new project book I am working on. This February, I celebrate my loves. I love sewing. I love my family and friends. I love the Sierra Nevada Mountains where I live. And I love so many of you who stitch and sew and have kept me in love with handwork. There has hardly been a day that goes by without an email, a Facebook post, an Instagram photo, a phone call, or a visit in my little shop in Bishop, CA, where I haven't felt the love and joy from a quilter or stitcher. This February I share and remember my love. My husbands birthday was a few days after mine. I remember fondly how we celebrated Valentines day, our anniversary and our birthdays in the same week. "Our Week", he called it. I lost him just a few days before our week was to begin three years ago. This February brings a milestone in my life. I will celebrate the love I had been given. Use the love that has carried me through the past three years. And start this new website and blog at this most special time of the year. I am ready to create new things again. 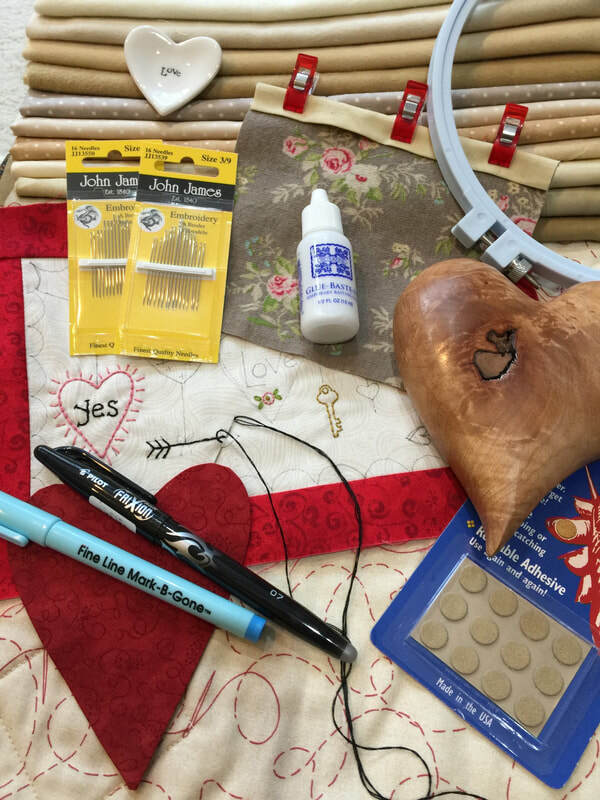 Venture into a brand new February doing what I love, sewing! Barri Sue Gaudet designer for Bareroots, stitcher, mom and grandma, friend, hiker, quilt and knitting shop owner, and now, blogger.